Vinyl siding is a popular home siding material option but has long been criticized for sometimes looking a bit unnatural or fake looking as a siding material. Similar to aluminum siding, vinyl siding comes in a variety of styles, including vertical, textured and horizontal panels, and comes in a range of prefinished colors. Some of these colors were rather "exotic". Since it seems some of these "exotic" vinyl siding colors were not found in nature it was a criticism somewhat deserved. But vinyl siding now has a green look! 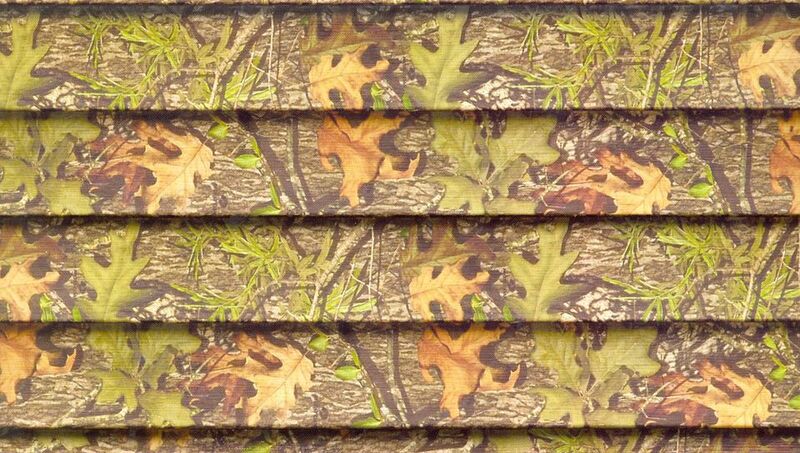 A product by Continental Siding provides a Mossy Oak camouflage look to vinyl siding. The product is called WildSide Camo Siding and is designed for applications where the design calls for the building to blend into the woods or forest. Whether you are looking for a siding material for your shed, garage or hunting blind or cabin in the woods, this product may be of interest. The siding accomplishes the camo look by using a KYNAR PVDF film finish providing the Mossy Oak Camouflage look and providing good color protection. Although this camo siding is not for everyone or every application, it does provide a great green look alternative to the old vinyl siding "colors not found in nature" problem. Vinyl siding is a good siding choice for homes but it can get damaged. Vinyl siding repair can sometimes be difficult in trying to match a particular color. However, matching this camo siding will make siding repair a breeze.